Discover the biggest archipelago in the world! With more than 15,000 islands, Indonesia is a tropical and wild land, offering landscapes that have a very unique beauty. A true mosaic of ethnicities and landscapes. Muslims, Christians, Buddhists and Hindus rub shoulders daily and everyone lives at their own pace, in a peaceful cohabitation. Experience a change of scenery in the middle of these sumptuous landscapes with lush vegetation, paradisiacal beaches, but also places of culture and tradition. 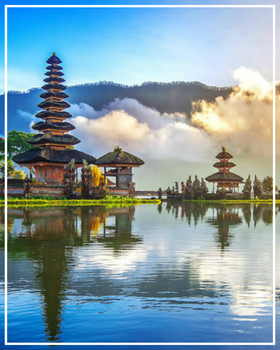 Bali is a generous land, fluctuating between forests and green paddy fields. Nicknamed the Island of the Gods, this destination is well-known for its family activities, fine, sandy beaches, turquoise lagoons and surf spots. Close by, the protected lands of Lombok, discretely open their arms to you, with their forests, vulcano and intimate beaches, a mixture of turquoise water and white sand. Indonesia seems to be one of the best destinations to escape the European winter and warm up in the sun. In this paradise of Eden, this archipelago oozes charm and exoticism and has a lot to offer its travellers. Our advisers are at your disposal to guide you in your choice of villa rental in Indonesia. Harmoniously blending Balinese architecture with modern decoration, they offer a whole plethora of prestigious services, to seduce even the most demanding clients. Many of our prestigious homes offer a bespoke service with house staff at your disposal, but also sumptuous private pools or authentic houses with direct access to the beach.